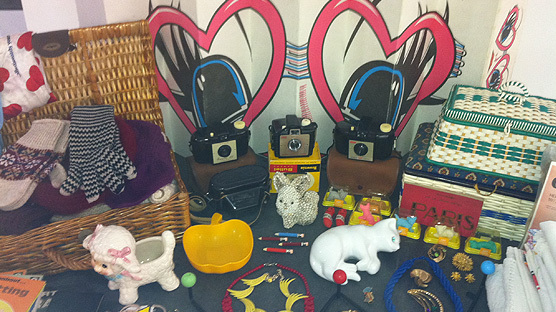 My little table of Thrift-ola finds for sale at the New Gallery Jumble last Saturday. I’ve lived in London for 15 years and on Saturday I visited Peckham for the very first time. It was quite exciting. As I stepped off the 77 with my suitcase of swag the first landmark I spotted was a splendidly large eel and pie shop, so this East end girl felt immediately at home. 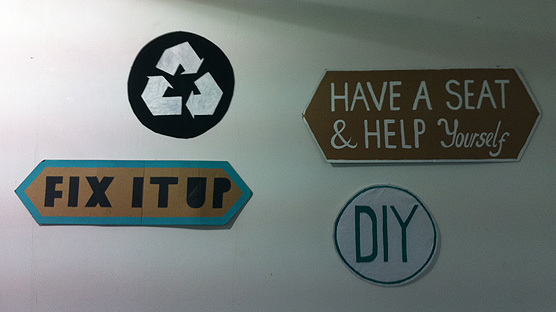 Homemade signs adorned the walls in the New Gallery Jumble. I have no sense of direction (even with google maps) so after going in the wrong direction twice I finally found my way along the Peckham road, over the border into Camberwell and inside the New Gallery. I arrived early enough to treat myself to a sausage and coffee breakfast and had lots of fun chats with Ashley from California who was looking after the jumble as Tatiana the usual host was away for the day. 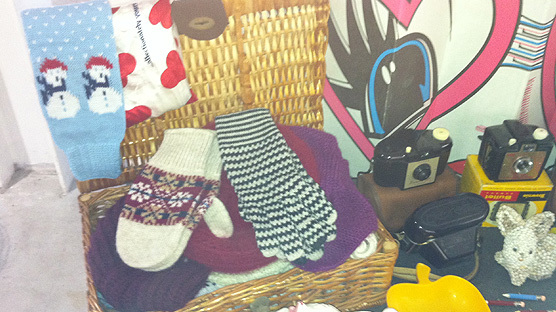 A wicker basket full of vintage hand knitted fun. I could only bring one case of loot as I didn’t fancy paying taxi fares so I selected what I thought the local arty/studenty crowd might like. My table included craft books, vintage cameras, pencil pins and as the Autumnal chill is creeping in a basket full of winter warmers: mittens, knitted turbans, bobble hats & scarflettes. I detest having my picture taken *gritted teeth smile* can you tell? I have to say it was really quite quiet with both vendors and customers. We all agreed it was due to it probably being the last sunny weekend for a while as the weather reports have been talking snow. 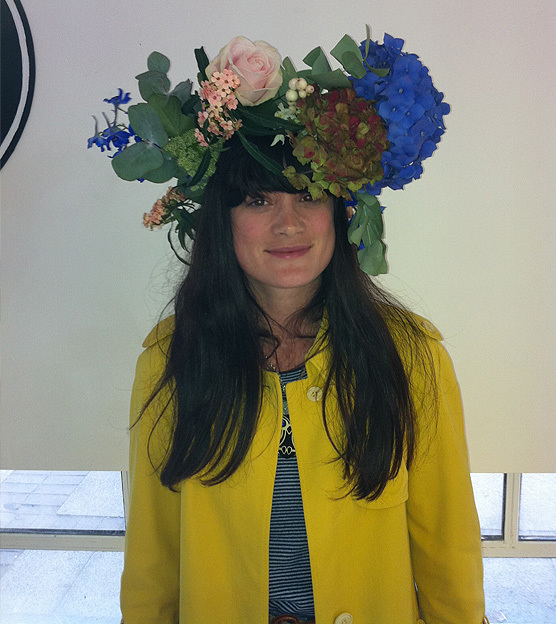 I still had a really fun day and made the most of the free workshops including making myself a GIGANTIC flower headband. I hadn’t intended it to turn out so mahoosive, just got a teeny bit carried away as usual. A local florist donates flowers that would normally have been thrown away to make the headbands – such a lovely thrifty idea! Mine is now hanging upside down on my front door and looks pretty as a picture. The delightful stall opposite me was a mountain of colourful pom poms. I just wanted to drive right in. One of the best things about doing a stall is getting to know your fellow sellers. I originally met many of my best London pals selling at some kind of fair or market. 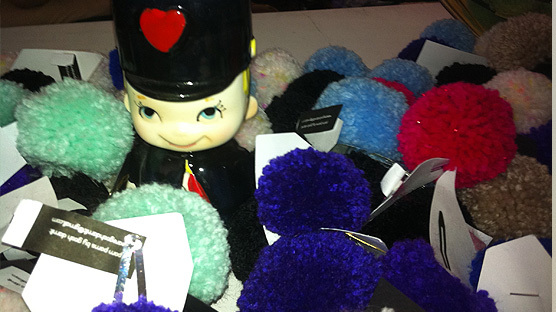 On Saturday, I met one of my Hackney neighbours who was selling pom poms (we’re already in collaboration talks!) and the lovely Catt who was touting little ramekins of crafty fun at a pound a pop. All in all my first ever trip to Del Boy’s manor was a fun one and I shouldn’t leave it as long before I visit again as I’ve a feeling the charity shops could be pretty special.